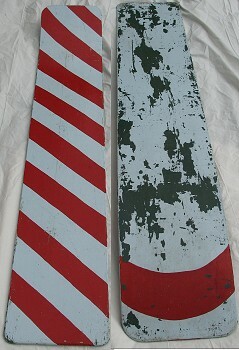 1950 Lamaroo Belly Board 5ft 6"
Timber board with (steamed) turned up nose. Painted. Deck: White with red offset bands. Bottom: White with red curved band on the nose. The board has been repainted in the current decor, the bottom originally probably was the dark green as shown on the bottom where the new paint has been damaged by riding the board onto the beach. Added to surfresearch collection March 2008. Item said to be from a house on or near Phillip Island, Victoria. 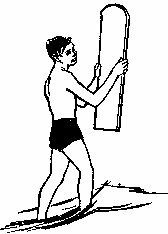 Solid timber handboards/bellyboards were in use on Sydney's beaches before the visit of Duke Kahanamoku in 1914 - see History/Duke/Detailed Analysis. The enthusiasm generated by this visit saw Sydney surfers persue the developement of the standing board and prone craft were dominated by the Surf-o-plane, circa 1933.These boards were in Victorian use as early as 1915, by a Mr. Jackson and Mr. Goldie at Point Lonsdale, after a visit to Hawaii. They were either imported or homemade adaptations and in 1915 they encouraged a local girl, Grace Smith Wootton, to take up the sport. Plans of solid timber prone boards were pulished in Popular Mechanics magazine July 1934 and Popular Science magazine August 1935.These illustrated that such boards were already in use in the USA and publication in such magazines probably saw these plans distrubuted world wide. The design was popular in the southern states of Australia and in New Zealand, South Africa and UK. Although many were probably home made, this and several New Zealand examples were probably factory made - note regular shape, nose lift and paint decor. Edmunson pages157 - 167, note Figures 51 and 52.
from Longboard Surfshop (NZ) On-line Auction catalogue, 1999. Waterproof resin-bonded or marine plywood. Point Lonsdale Victoria, circa 1915. The board was made by a local carpenter, cost 12 shillings ($1.20), with her initials carved in one end. 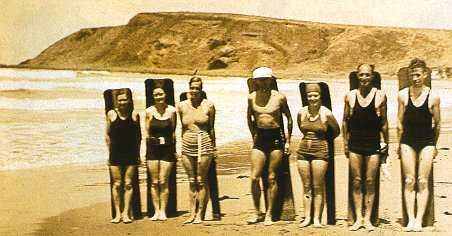 Lamaroos at Phillip Island, Victoria 1935. Note that two boards to the left appear to be laminated sections. 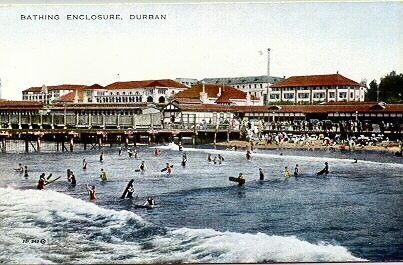 Postcard : Timber prone boards, Durban, South Africa circa 1950.